Roasted Red Pepper Spread is delightfully sweet smoky pepper and tomato spread that can be used as a dip with naan bread, a base for pizza, a sauce for pasta, a topping for burgers or sandwiches, the possibilities are endless. We have close friends that worked in Uzbekistan and have shared with us the delights of Uzbek recipes. One of my favorites is the tradition of canning winter salad (qish salat). Our friends introduced us to this Roasted Red Pepper Spread when they served us a traditional Uzbek dinner. The spread was served with naan, as they explained to us the process of tearing off pieces of the traditional bread and dipping it in the spread. 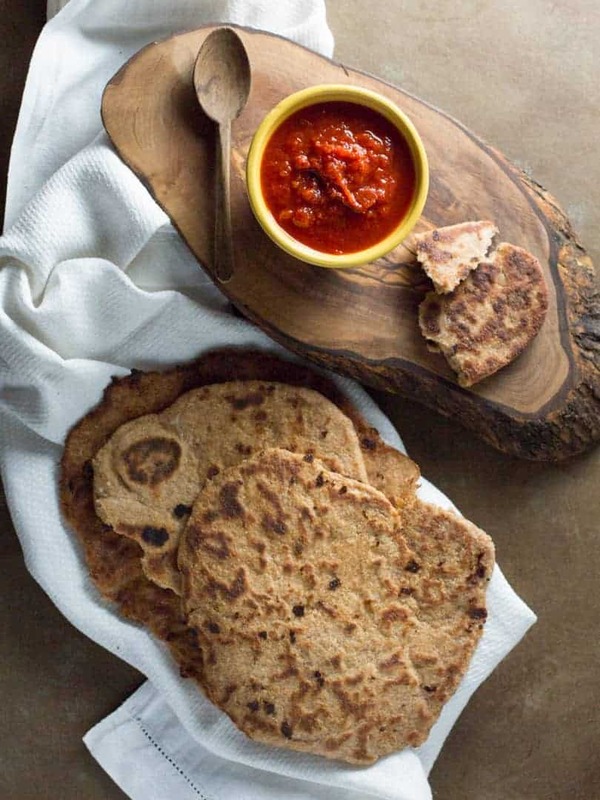 To make your own homemade naan be sure and visit my post for a Whole Wheat Naan Recipe. This spread was something I wanted on my pantry shelf year round! I set out for the farmers market purchasing sweet red peppers and ripe tomatoes to can up my own Roasted Red Pepper Spread. I was delighted with the results and it has become a staple in my canning stock pile each summer. Peel and seed peppers and tomatoes. Place peppers and tomatoes in a large stock pot, adding sugar and salt. Simmer on low, stirring every 15 minutes, for 1 to 2 hours until peppers and tomatoes are cooked to a smooth, creamy spread. PROCESS half pints for 10 minutes at 10 pounds of pressure in a pressure canner, adjusting for altitude. Remove jars and cool. Check lids for seal after 24 hours. Lids should not flex up and down when the center is pressed.